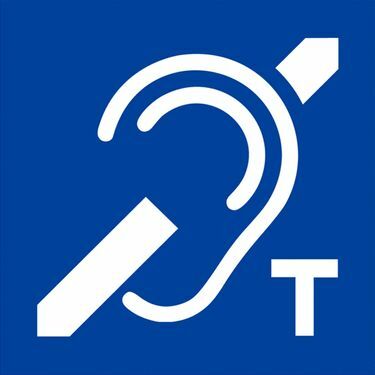 Look for this logo for the fully looped assistive listening system. The Seattle Repertory Theatre has installed a hearing loop system, which enables patrons to hear throughout the theater building, not just in the seats. Following in Town Hall Seattle’s footsteps, Seattle Repertory Theatre has installed a fully looped assistive listening system. The wireless technology transmits speech or music on stage directly to guests’ cochlear implants or hearing aids equipped with a T-coil, a small coil of wire inside a hearing device that is designed to pick up a magnetic signal. The hearing-loop system replaces the more common but less effective infrared system, which used invisible light beams to carry sound from the stage to a personal receiver. That system worked only when patrons were in line-of-sight relation with the stage; if they turned away, they might hear static, and the infrared system would not work when they were in other parts of the theater — concession stand, concierge desk or coat check. Seattle Rep began planning the new system after a presentation from Perazzoli, who is hearing-impaired and has been wearing hearing aids since she was 19. She explained to the Seattle Rep’s staff the importance of having fully looped systems in public spaces. “I have to get there early, and all my friends are having a drink and I’m in line trying to get my equipment, so if for some reason the equipment doesn’t work, I am kind of on the spot,” Perazzoli explained. One of the beautiful things about the fully looped system, Perazzoli added, is that it allows the hearing-impaired to come in and sit down just like everyone else, as long as their hearing aids or implants are equipped with a T-coil. Users switch their devices to the “T” setting, which may need to be activated by a hearing specialist before use. Those without a T-coil can still grab a neck receiver at Seattle Rep’s coat check. She says having that T-coil symbol around, which signifies whether a certain area is looped, also generates awareness. The sound system is manipulated for each show. Producing Director Elisabeth Farwell-Moreland sits in-house during technical rehearsals while wearing a hearing device to make sure guests are getting the best experience possible. Seattle Rep used its production of “Luna Gale” as a practice run in March. The money for the installation came from public and private donors.